You heard it a thousands times, you need at least 1,000 qualified subscribers to make a decent income online. Interested? Well keep reading, I’ll be explaining what a Lead Magnet is and how to create one in this step by step guide. A Lead Magnet is a free gift that is sent to a new subscriber. Free resource work (Excel, Word, graphic, …). Video or audio training exclusive to email subscribers. Discounts for shopping at your store. Increase the number of subscribers to your list: by offering more than just the subscription, you will get more subscribers. 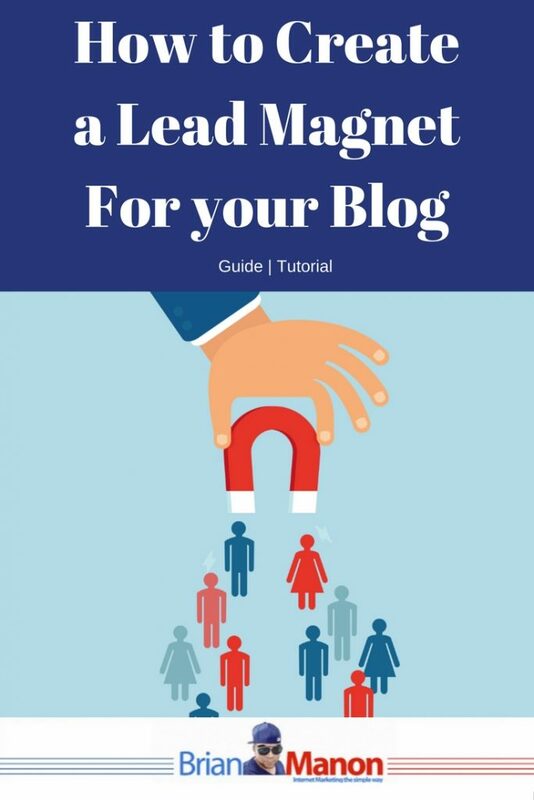 Send traffic to your blog key post: The Lead Magnet can send traffic to certain key posts, affiliate sales pages, or posts that will help turn your readers into buyers. Help Facilitate the sale of a product: Lead Magnet can be a “mini” version of something that you will sell to your list at a later date. Why is it so important to have a Lead Magnet? Think about it: what real incentive does a subscriber have to join your list? A lead magnet is the first step in a successful email campaign. It is used to build a huge email list and capture emails of potential customers and return visitors that you can promote your content and products to. The importance of a large mailing list cannot be under-estimated. But what do they get? I’m sure you’ve seen that almost all site offer a newsletter in exchange for you giving them your email address. Most people get enough emails in a day and don’t want to recieve another unless they were getting something back in return. About 10 years ago offering a newsletter worked great since it was very rare for sites to do it, Now that all sites offer newsletters you need to be more creative in order to get the reader to give you their email addresss. What would you do to get the attention of the locals in the area? There are many things you can do. One idea is offering them a coupon or a free gift for coming to your bar. If your blog is about first time parents, maybe you could give away an ebook. The ebook could be about “Five tricks to make your baby sleep through the night”. This will defintly be of interest to first time parents..
And if your business is properly aligned, your lead magnet will have be related to your services or products that you will sell later in sales funnel. Sell parenting courses for new parents. On your blog have posts about childhood education and how to raise their children. Your lead magnet is an ebook called “Five tricks to make your baby sleep through the night”. This will insure that all readers that subscribe to your email list have an interest in that topic. # 1 Find out what your readers No.1 problem is. The first thing to do, especially if you’ve been blogging for a while (3-6 months), is to review what are your most popular posts. To do this you just go to Google Analytics click on the ‘Behavior’ tab, then click on ‘Site Content’ and ‘All pages’. There you can find your posts with the most page views and your popular posts. If you also have a post with many comments, take advantage of it . The fact that your readers comment shows that there is interest. Once you have located the most popular and commented posts, visit these posts and write down the theme and common questions that appear in the comments. This info will guide you in creating your lead magnet. After analyzing your posts you should have a good idea of what your readers problems are and what they need help with. A Lead Magnet should only take 1-2 hours to create. Checklist: Do you have a very long post you can divide into steps? Create a simple checklist with steps and offer them as a guided map for your post. Worksheet: Some posts require the reader to do some work so that they can understand everything that was written. Create a small worksheet with the task at hand to get your readers to subscribe. List of resources: Create a list of tools to support the article and explains what each one is. Extra tips: give out a extra 10-15-20-50 short and essential tips on the topic your are writing about that can be read in 5 minutes or less. Exclusive video: Create a small video tutorial on the topic you are writing about. When you have your Lead Magnet ready just put it in Microsoft Word or something similiar and format it. For the graphic which you will include in your optin box or subscription form (ConvertKit), you can use Canva to create. Create a PDF and your ready to go. Once you have the PDF you just have to include it in your site and replace that boring newsletter form you had before. Create a subscription form: For this site I use Convertkit and OptinMosters to create my subscription Forms. You can also check out Thrive Leads . In this step it is important that you include copywrite that your ideal client understands. If you offer something impressive but with a horrible copywrite no one will want to download it. A good Lead Magnet is only one way you can build a list. These are tactics I have used to get my email subscribers to over 10,000 and make over $6k every month from it. Lead Magnet = more visibility, more authority and more sales. Hey, thanks for this article and the VERY practicle example (yes I signed up to your list to get the free checklist and probably would not have if it were not for that offer). As someone new to blogging (I hope to launch my blog in about a week) I am currently reading other blogs and looking for ‘how to tips’. Your tip here, and its step by step instructions is going to be a BIG help., I see now that i need to think about a really compelling free gift offer right from day one. One of the difficulties I face is that of needing to be original. I dont want to simply take someone’s work and claim it as my own, but equally there is little that is ‘new under the sun’. So how have you decided what material to offer? Is it all your own work, do you ‘license’ other peoples work to offer, do you reword things you have seen elsewhere? Now that I am a subscriber I look forward to receiving more useful stuff from you! Great post. I am intrigued by the quiz idea and took the mini course which was really helpful. I have utilized the lists and ebook. My goal on my Lifestyle site is to have a freebie for every category. I currently happen to be working on this very subject. This is wonderful advice that ill be sure to use! Great content! I’ve just created my second lead magnet and will definitely apply some of your tips. Thanks! My lead magnets have helped grow my list much better than just a plain subscription form. These are some great tips. I’ll have to revisit when making my next lead magnet. Thanks Brian!